The cross sections that a structural engineer works with range from common I-sections to complex composite or built up sections. SkyCiv’s Section Builder makes it easy to model your member’s cross section to determine complex shear, bending, and torsional properties. With SkyCiv Section Builder, you have a number of great features to help model and solve your member cross sections. We’ll take a closer look at the various use cases below. A section can be made up of a number of simpler shapes. SkyCiv Section Builder allows you to add multiple shapes so that you can compose your section easily. Simply untick the “clear others” checkbox and add more shapes to your section. A section can be a composite section, made up of shapes of different materials. SkyCiv handles these composite shapes with the Transformed Section Method, allowing you to add that concrete profile onto your I-beam, or analyse that laminated beam! Sometimes the section you’re modelling is hollow, or has cutouts / holes through it. SkyCiv Section Builder allows you to add a hole / cutout in the same way that you’d add another shape to your section and by designating it as a negative geometry. Modelling your section from a CAD / CAM package and need it analysed? Have a DXF file from a manufacturer’s website? 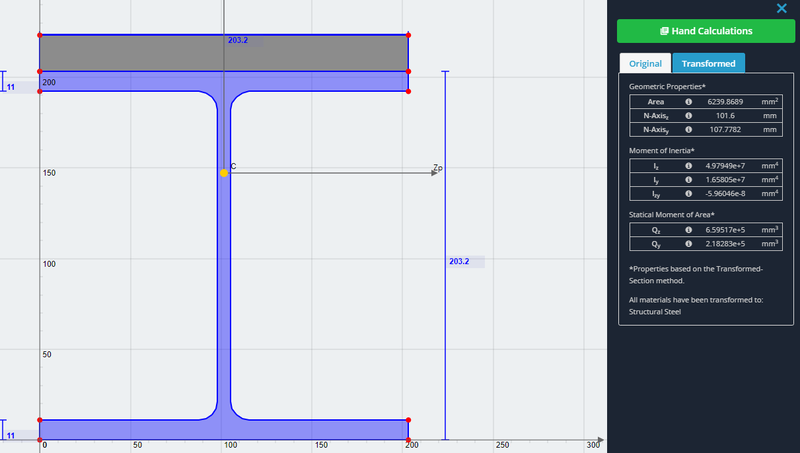 SkyCiv can take your DXF file and import it directly into Section Builder to be analysed. Very complex shapes can be modelled, including those that are made up of cutouts, multiple shapes, lines, arcs, and polylines. Modelling a common section? Make use of our 18+ template shapes to add to your section, ranging from I-beams to hollow rectangular sections and more. Start modelling with just the click of a button, and edit the dimensions. Using sections from a catalog? We have you covered with cross section catalogs from around the world, spanning the United States, Canada, Australia, Britain, and Europe. 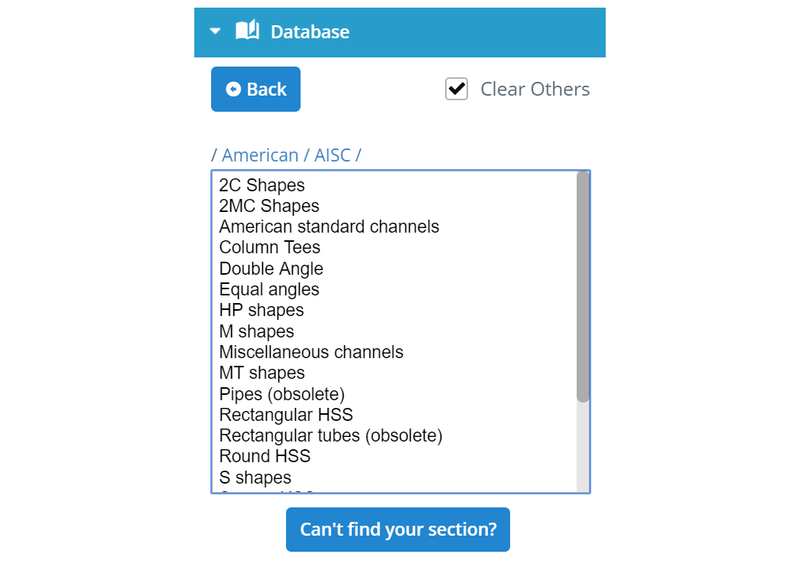 With just the click of a button, you can select a section from catalogs like the American AISC steel manual. Modelling a section that we don’t have a template for? Analysing a unique shape for a unique application? SkyCiv provides the tools to do just that. Points Shapes are the most flexible type of custom shapes, because they allow you to create any type of shape as long as you know your cartesian 2D coordinates. Add a radius on any corner that you define! Line Shapes save you time with modelling folded sections like hat sections and Z sections. Simply define your line path, thickness, and radius, and you have a fully defined section ready to go. 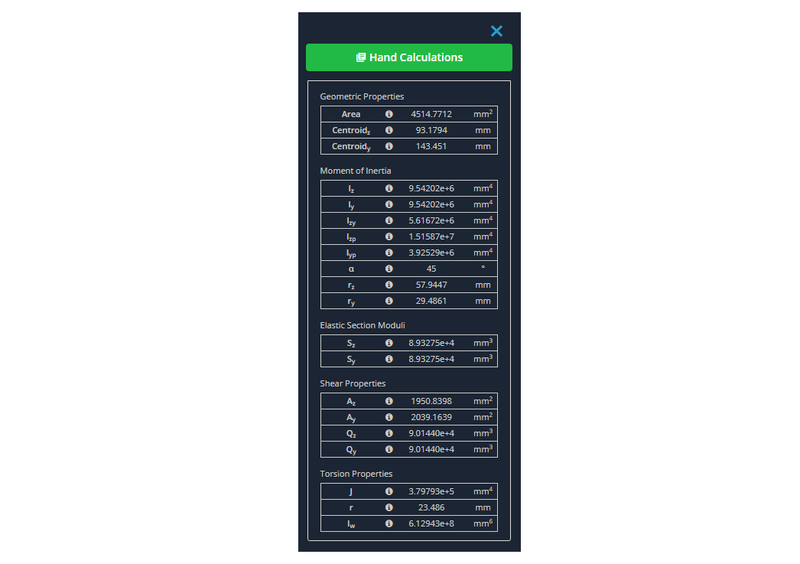 Need to determine the section properties of a section that has been translated, rotated, or mirrored from the reference axes? SkyCiv provides easy to use options to perform these operations. Mirroring in particular lets you easily model a back to back section. Get results for your cross section spanning general, bending, shear, and torsion properties. We make use of an FEA method to determine our torsion properties including torsion constant, warping constant as well as some of our shear properties (shear area). Calculating results for a composite section? We provide both the original (geometric) results along with the transformed section results (whereby shapes are transformed by the transformed section method). Need to verify the results or learning how to calculate section results yourself? 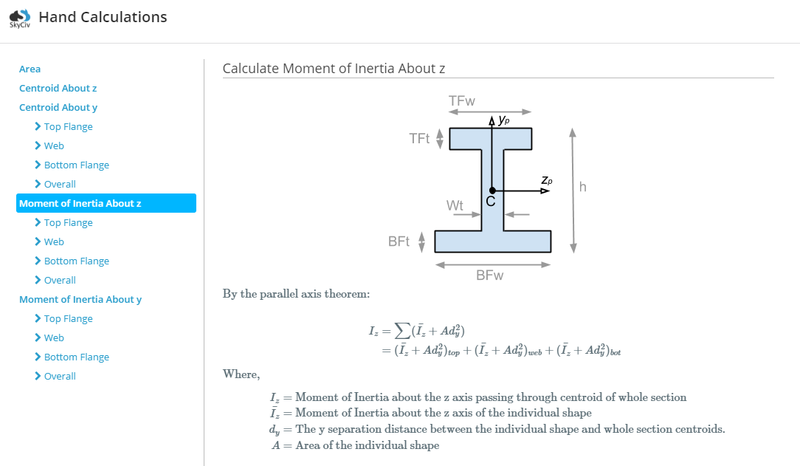 We provide step by step hand calculations for a number of our results, including centroid, area, and moment of inertia. Available for some of our standard template shapes. Hope you find this guide of SkyCiv Section Builder's features helpful! For more features and functionalities, check out our SkyCiv Section Builder for more detailed guides. We hope you enjoy these quick tips on how to model easier and faster. If you’ve never used SkyCiv before, SkyCiv is a powerful cloud structural engineering software that you can access from anywhere, anytime. Book a free demo today to see the difference yourself!